When it comes to picking a blogging theme for your website, there are plenty of options out there. Luckily, WordPress offers website owners lots of flexibility and power when it comes to design and functionality, and if you have the right WordPress hosting provider you will have a fast loading, well-performing website as well. WordPress is easy to customize, has a variety of pre-made themes for personalizing the look and feel of your site, and can help you target your readers and encourage them to engage with your best content. However, a good WordPress blogging theme can be difficult to find since there are so many available options in the WordPress Repository and in marketplaces such as Envato. In fact, there are tons of free and premium choices, all presenting different features, so knowing which one will best suit your needs is a challenge. That said, a high-quality WordPress blogging theme will have full-featured navigation, branding opportunities, many different layout options, lots of customizations, and a personalized appearance. 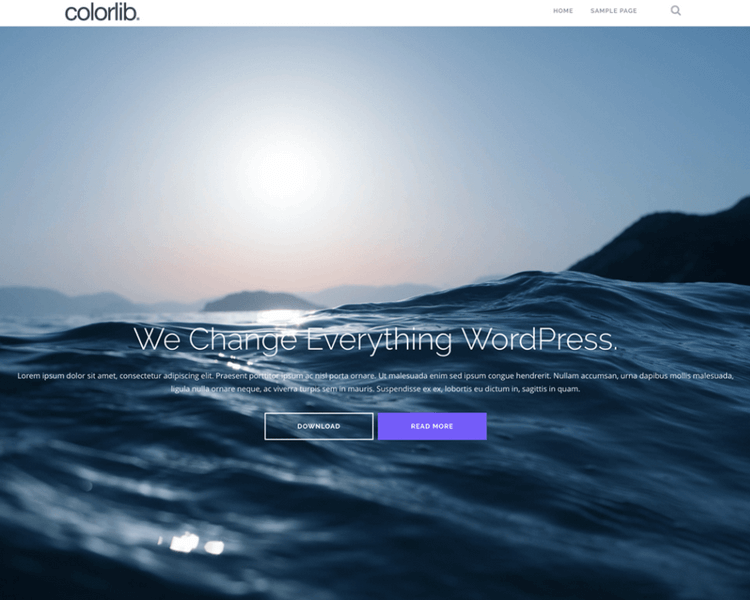 If you are in the mood to find a new WordPress blogging theme, or are just starting out and need a solid foundation to build your website on, check out this roundup of some of the best WordPress blogging themes available today. These themes comes packed with features, have varying design opportunities, and are suitable for blogs of any kind. 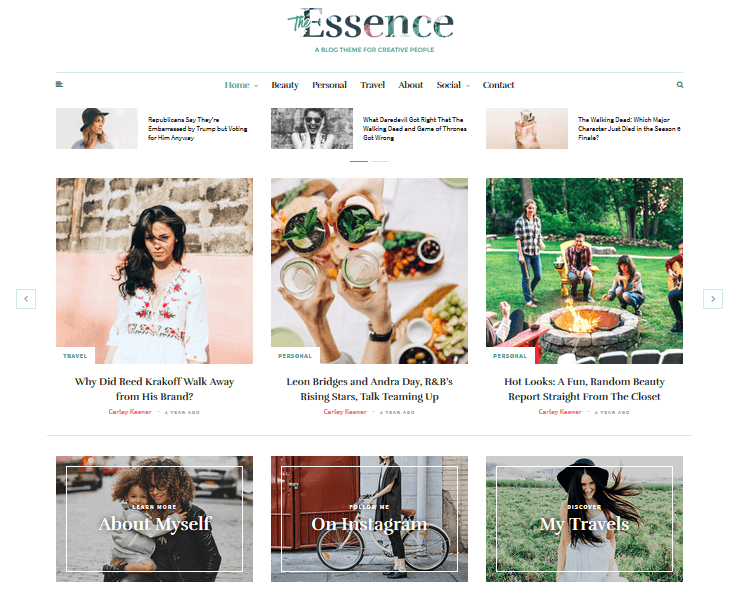 The Essence is a responsive WordPress blogging theme with a feminine touch. It comes packed with features needed to share your content across a large audience and offers plenty of customization for making your website stand out. 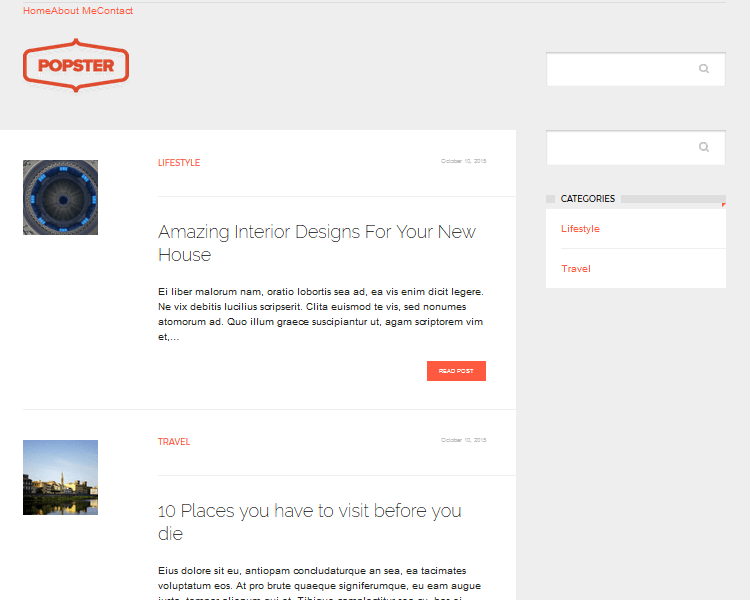 For instance, enjoy 17+ different homepage and blog layouts and the MeridianStyler front-end customizer. In addition, create a stunning featured slider, add your Instagram feed, and integrate social media icons directly into the header for a great first impression and a boost in content sharing. 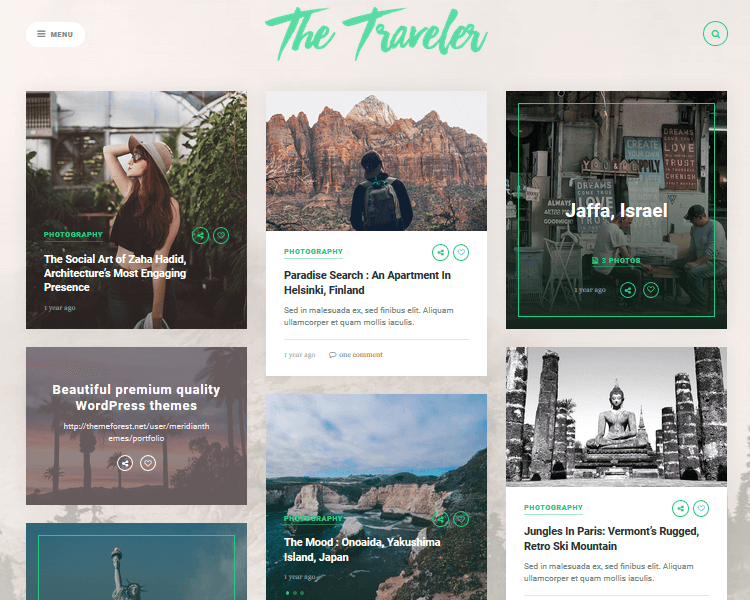 The Traveler is a light and modern blogging theme designed with travelers in mind. IN fact, with an abundance of color options, post and page layouts, and the ability to translate all of your content for international readers, this theme has everything you need to personalize your blog. More so, you can integrate social media profiles and add a custom About Me widget so your readers can share their favorite stories and learn all about you as they follow you on your adventures. Popster offers WordPress bloggers a simple and fresh way to showcase writing of all kinds. Focusing on the written word, utilizing lots of whitespace, and implementing dynamic imagery that adds to the visual appeal, you can build a strong blog with this theme. For example, enable linking in both the header and footer for better navigation and translate all of your content using the included .po and .mo files. In addition, enjoy regular updates, 100% responsive design, and cross-browser support so all of your readers enjoy the most recent version of your site no matter how they access it. Newspaper is a blogger’s dream. For example, it allows you to share articles and blog posts with ease, supports video integration, and even has a built-in rating system. Moreover, it supports bbPress, BuddyPress, and WooCommerce for your forum and online shop portal needs. 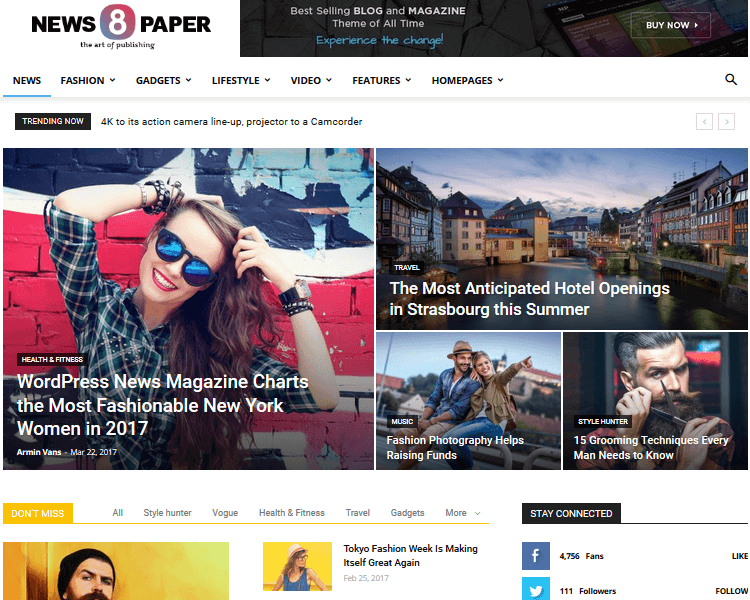 In the end, take advantage of Newspaper’s exclusive drag & drop page builder specifically designed for news sites, choose from dozens of unique demos to get started, and don’t forget to monetize using the built-in AdSense and banner support. 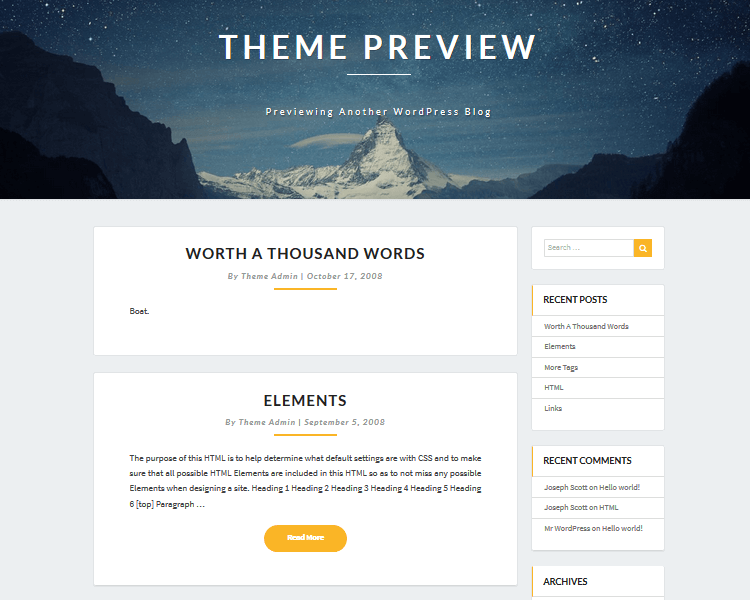 Lighthouse is a free WordPress blogging theme found in the WordPress Repository. It comes SEO optimized so your content indexes properly and ranks well. In addition, it comes with a minimalist feel so journalists, writers, and authors can share their breaking news and best stories with a large audience, without all the flashy distractions some blogging themes come with. Lastly, customize the header and background image, add a logo for branding purposes, and even make your blog layout full width for a powerful first impression. 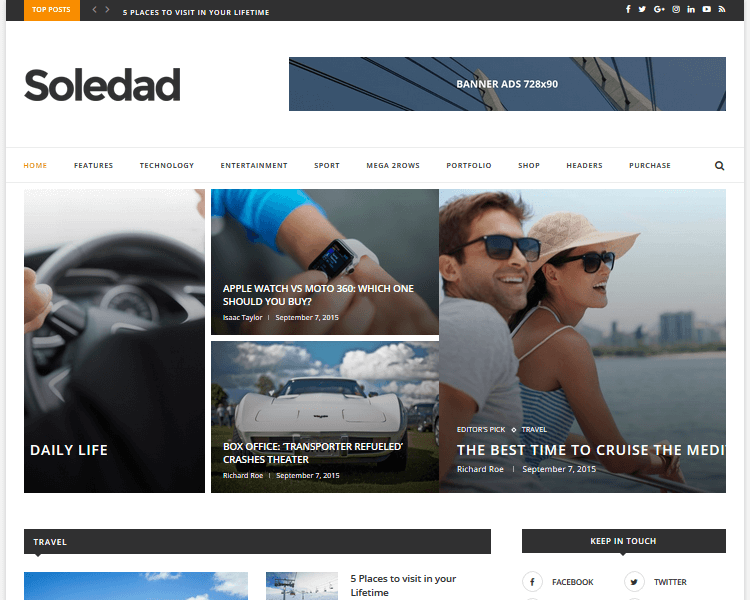 Soledad is one of the best-selling WordPress blog and magazine themes on the market today. If you are looking for a theme that has unlimited customization, you are in the right place. 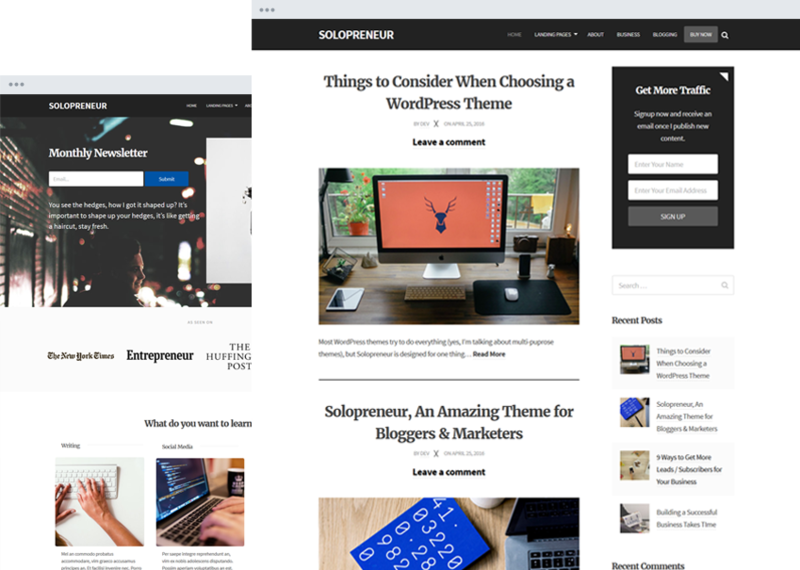 For example, Soledad boasts over 300 Live Theme Customizer options, 900 demo homepage styles, and 300+ slider and blog layout combinations. Plus, it comes with a premium recipe plugin, review plugin, and support for both Contact Form 7 and MailChimp for WordPress. Altogether, impressing readers with your content, building an email list, and even monetizing with advertisements are all possible using this truly multipurpose blogging theme. 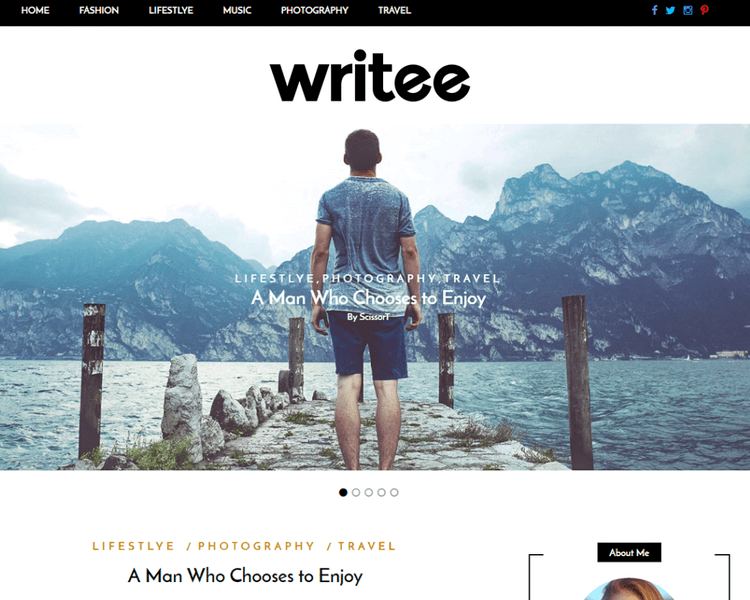 Writee is a creative and bold theme offering bloggers of all types an easy way to express themselves freely while attracting all the right kinds of people. To start, it comes fully responsive and mobile-friendly so all site visitors can view your content seamlessly. In addition, it comes with threaded comments for increased user engagement and several .mo files for translating content and reaching a more global audience. In the end, this theme, although simple, gives WordPress bloggers the perfect platform for writing and sharing high-quality content. 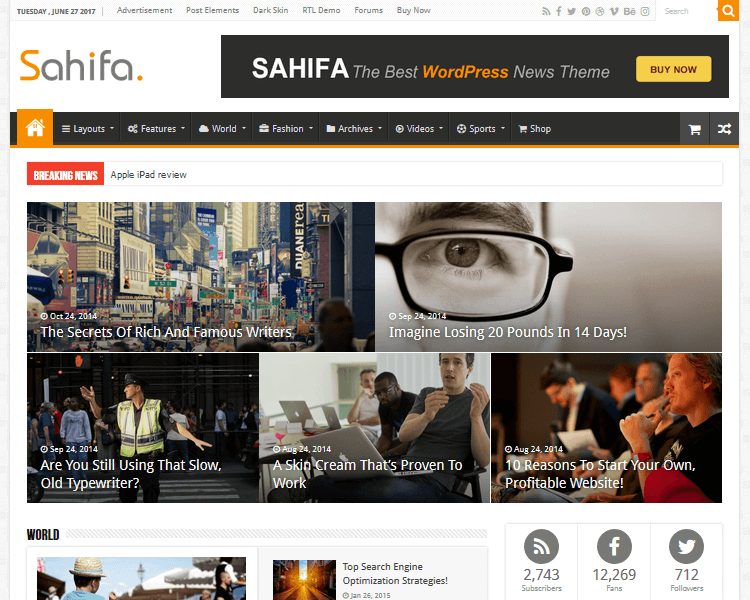 Sahifa is the ultimate WordPress news blogging theme and one of the most popular to date. 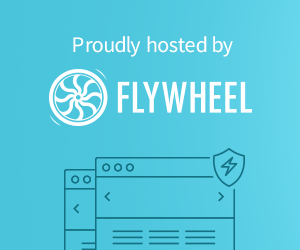 It comes with a fully functional Live Theme Customizer and admin panel, bbPress and BuddyPress support, and the exclusive TieBuilder for easy drag & drop homepage building. Additionally, translate using the WPML translation plugin or the built-in translation panel, build an online shop using WooCommerce, and see just how popular your blog is with the cool Social Counter widget. 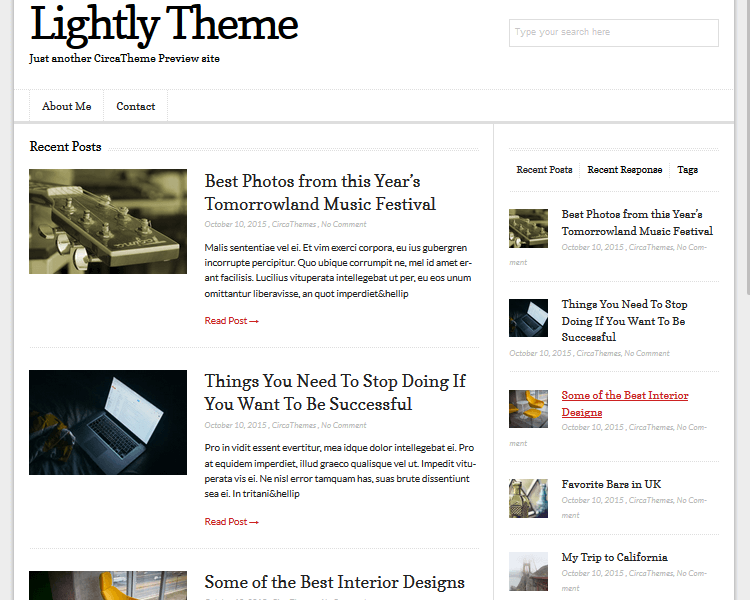 Lightly is a minimal blogging theme that places content at the forefront, sans any distractions. For example, easily make changes and personalize your theme using the built-in Theme Customizer, upload a logo complete with text with a few simple clicks, and don’t worry about speed – this theme has the highest quality coding possible for seamless site performance. In addition, Lightly comes with regular updates, a widgetized homepage, and localization support for translating all of your site’s content. 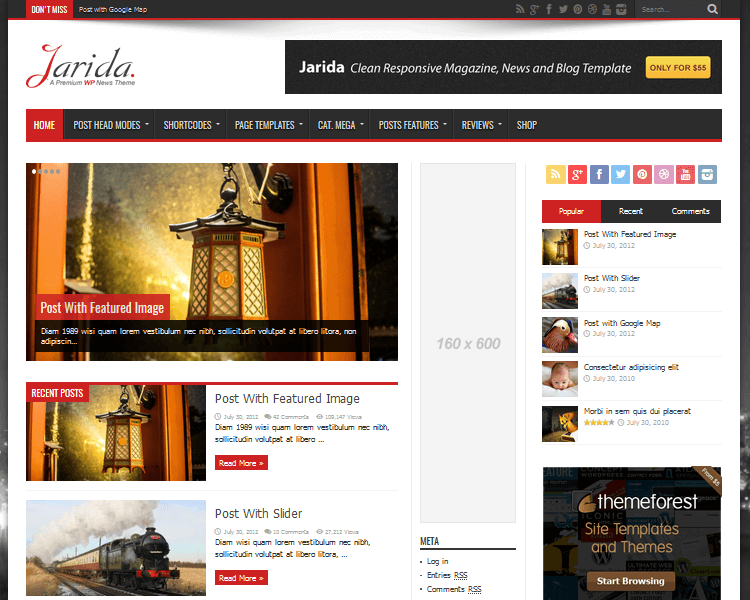 Jarida is another great premium WordPress blogging theme meant to inspire website owners to write and encourage website visitors to read. It comes with an easy to use drag & drop homepage builder, a built-in review system, 650+ Google Fonts, and 30+ shortcodes for extending your site’s design and functionality. To add to that, Jarida has unlimited color and sidebar options, supports forum plugins like bbPress and BuddyPress, and even includes the option to add iPhone and iPad app homescreen icons. Shapely is a stunning and versatile one-page WordPress blogging theme that works great for business, landing page, and portfolio websites. Yet, it has the flexibility to be used for blogging or magazine websites as well. To start, it has built-in SEO structure for optimal indexing and search engine rankings. In addition, Shapely also comes with several custom homepage widgets for adding things like testimonials, parallax sections, and product or service information. 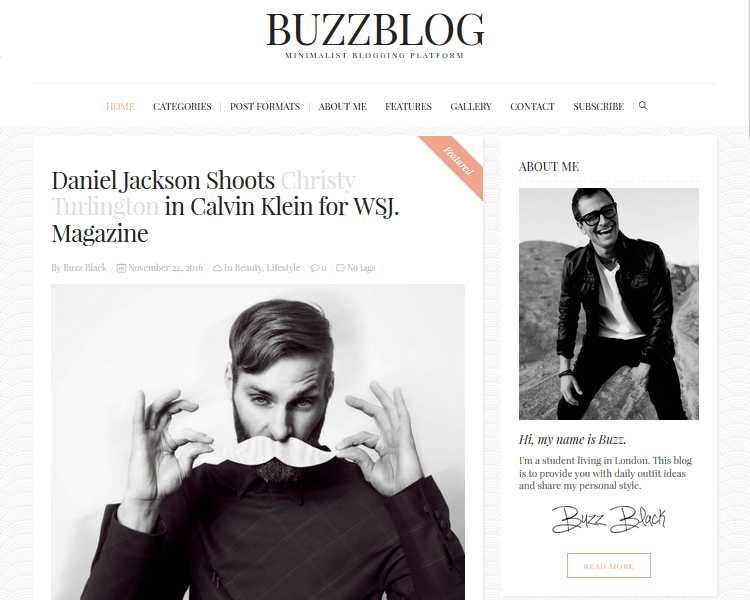 BuzzBlog is a clean personal WordPress blog theme packed with plenty of features to get the job done. For instance, choose from 60 homepage variations, 5 built-in headers styles, and 9 custom homepage templates. In addition, utilize the shortcode builder for extending your site’s functionality, enjoy retina ready image displays, and translate your content to build an international brand in no time using the popular WPML translation plugin. In the end, finding the perfect blogging theme is going to come down to your personal taste, design aspirations, overall goals, and of course, budget. However, WordPress is a platform that has something for everyone. As you can see from the above-mentioned WordPress blogging themes, there is plenty of variety when it comes to features and customization options. If you are looking for a great way to showcase your best content, appeal to your readers the moment they click on your website, and enjoy the easiest way to manage your blog, all from one convenient location, then check out one of these WordPress blogging themes for yourself. Have you used any of the above listed WordPress blogging themes? Have I left one off the list that you feel should be included? I would love to hear all about it in the comments below!